Is Mayor Crombie’s Public Transit Plan "Mississauga Moves" Still Viable? During the 2014 municipal election, Bonnie Crombie's campaign released Mississauga Moves — her plan for public transit in Mississauga for the next two decades (coincidentally her opponent's transit plan was entitled 'Move Mississauga'). It seems appropriate with all the recently announced transit investments and this being the halfway point of Mayor Crombie's first term to examine her plan and see if most of what she proposed is still viable. As Mayor Crombie converted her website from the campaign version to the governing version, the plans referencing Mississauga Moves were gone and somewhat difficult to find. In fact, the only place I could locate a high enough quality map of the Mississauga Moves plan was on the blog of this Korean Real Estate agent. I hope this was not some attempt to cover up her transit plan in hopes people forgot about it, because so far, she's done pretty well on the transit file (at least within the confines of what is in her control). From the map, you can see the main lines of transit proposed by Mayor Crombie were the Hurontario LRT and the BRT adjacent Highway 403. Her plan also suggested rapid transit infrastructure along Dundas Street and Derry Road. There is also the matter of adding some smaller GO stations on the existing Milton and Lakeshore rail lines as GO Transit implements Regional Express Rail (RER) as well as rail electrification along those corridors to get faster trains. Compared to some of the transit plans proposed, Mayor Crombie's may be dour but it's actually doable. Her opponent from the last municipal election proposed to build an express rail link from Meadowvale GO to the Malton GO station, which would have cut through various neighbourhoods as well as natural habitats. I also heard ideas to make Dundas an HOV lane, which would have exacerbated traffic issues. And don't even get me started on John Tory's 'Smart Track'. How's that going so far? On page 24 of Mayor Crombie's election platform "Our City, Our Time", regarding RER she states, "RER requires the electrification of each rail car, which allows for more frequent trains and additional stations because the improved acceleration and deceleration dramatically reduces the time impact of station stops." When Mayor Crombie made these proposed GO stations, she and her team did it within the understanding of what was within her powers and jurisdiction in conjunction with partnerships with our provincial transit agencies and provincial government. Electrification of the GO rail lines and making them run as an 'all day two way' service falls along with what the province is already rolling out, just look at what was recently announced for Kitchener. They studied each proposed location and the capacity is there to put a GO footprint in those areas. Making sure it's doable and sensible is much more important in my view than making grandiose promises that just get attention. This is ultimately the vision for the future of the Milton Line and the Lakeshore Line for Mississauga in the next 20 years and beyond. People hear "additional GO station" and they expect exact duplicates of what is already in existence: more Cooksvilles, Erindales or Dixies. Big massive lots for ample parking, basically a nice central station in the traditional sense. But if you believe this, then you should reexamine Mayor Crombie's platform. If you read it very carefully, Mayor Crombie says the stops she's proposing are not going to be full-fledged GO stations. They will have smaller footprints because of proximity to neighbourhoods and they'll make it easier for residents to walk to nearby stations. So what she was saying is, it would be something smaller, like what they have as the Square One GO station right now for buses, but perhaps without as much parking. The proposed new stations are not going to be like the ones you're familiar with. That is promoting the old way of living in Mississauga. By making smaller stations along the rail line, working in conjunction with the existing GO stations and factoring in turning Milton and Lakeshore into RER and electrified transportation, you will in effect get a subway that runs on the existing train line: a SURFACE SUBWAY. If you take a look at the Mississauga Moves map from Mayor Crombie's platform and see where some of her proposed stations are located you can see that linking them to existing MiWay bus routes was part of her thinking. 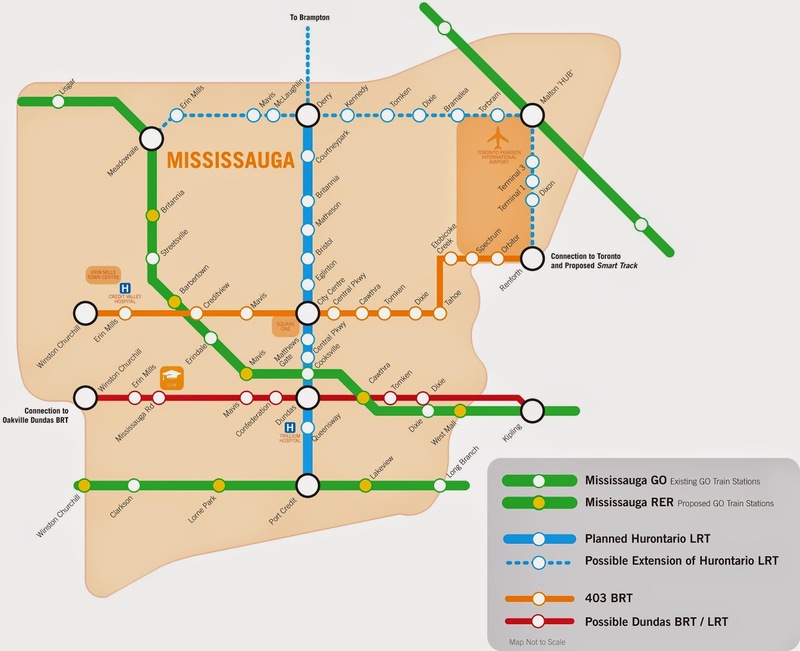 For example, proposed stations at Mavis and Cawthra would allow people who come back from downtown Toronto to get off there and take existing MiWay bus routes along those main arteries to get home, or those living closer to Mavis and Hillcrest to walk home from a GO station, so they don't have to go all the way to Cooksville GO. The nearby Mississauga Flea Market could also see a boost in business if a Mavis station would allow people from further east to come out there. Adding the changes coming to MiWay, we could definitely see an increase in ridership for local transit as well as GO as options are expanded for commuters no matter where they are going. I was in the area one time and took some pictures of where the Milton rail line intersects at Cawthra and Mavis. If we're talking about putting in a small stop for commuters to get on and off when taking the train, is it possible to negotiate something with the current occupiers of the land (i.e. the Enersource building on Mavis and the construction site along Cawthra) to allow stations to exist? There's been this obsession over extending the Bloor Danforth TTC subway into Mississauga to Square One or something akin to that idea. People believe we need to improve our East/West connection to downtown Toronto. Well, to be honest, when you have Derry, Britannia, Eglinton, Burnhamthorpe, Dundas, Lakeshore East/West, the 401, the 403, the 407, the QEW, and two GO train lines, there's already a plethora of options to move in an East and West direction for a heavily car reliant city like Mississauga. Right now, I'm currently working a 9-5 job that requires me to move north of Mississauga, and I can attest firsthand that congestion along the north south routes (Tomken, Cawthra, Erin Mills Pkwy) is the most pressing traffic problem we need to deal with. Making sure that all the transit options we have in Mississauga, whether it's the GO train, MiWay services, BRT, LRT and of course our main streets and highways, coordinate and function with each other is the essential way to achieve this goal of getting people in Mississauga moving within Mississauga quickly and more efficiently. One of the proposed stations is the one on Lakeview, along the Lakeshore line. I spoke with Ward 1 Councillor Jim Tovey who represents the Lakeview area to gauge his opinion on whether that proposed station was possible. It made sense personally to me; Lakeview is a growing community and slated to get mixed use development in the next decade or so, and the only GO stops are between Port Credit and Long Branch, in Toronto. First off, the reason Lakeshore has trains running every hour is because they have more tracks laid down, so freight traffic runs alongside GO traffic. What Councillor Tovey explained to me was that even if Metrolinx electrifies the tracks, the diesel trains that run adjacent to the GO trains on Lakeshore are different in weight and hence would not comply with federal crashability laws, hence technologically impossible to implement. I get the sense that he was more protective and looking out for his specific neighbourhood. Before being elected, Councillor Tovey spent 20 years advocating that Lakeview be converted from the post war industrial gray zone it was into something more green with more residential/commercial use. And based on what he told me about the incompatibility of freight and commuter trains, environmental considerations were definitely on his mind. He didn't totally close the door on the idea though; he proposed where the Lakeshore line intersects with Cawthra would be a more reasonable location. This is one area where, if I was advising the mayor, I would tell her to forget about putting a small GO station here. It's too close to the already existing Streetsville GO when you put in electrification. This is mostly commercial industry area by the business parks, so in terms of promoting walkability it's a bit of a trek from nearby residential neighbourhoods. It would make more sense if you want people commuting along the GO to get here for their shopping or dining out needs. For the purposes of full disclosure, I have known Mayor Crombie for a number of years now and voted for her in the last municipal election. That said, I think taking a reasonable look at her transit proposals at this halfway point in her term would be beneficial in seeing how plausible it still is and whether some changes need to be made. I have provided in extensive detail of what my thoughts are, what do you think? Is Mississauga Moves still on track to 'GO' or should something else be proposed altogether?